If you've been reading my blog for a while or seen any of my travel guides at one point or another, it probably comes at no surprise how much I love food. It's a top priority I have during travel and it's the first thing I usually recommend to people who are asking for tips about a new city. Food and travel go hand in hand like a beautiful love story that I can't help but getting in the middle of. Cuisine is a universal (and romantic) language of culture and travel. It is quite literally how we "taste" the places we are visiting and get to experience them on a deeper level. It's because of this personal love affair with food that I've decided to bring you a new blog series: Global Eats. In Global Eats, I'll be bringing you recipes I love from all around the world so that you can taste the flavors of cultures near and far from the comfort of your home. So let's dive into our first recipe that will serve up some of those tangy, sweet, and spicy flavors all the way from Thailand! *Stay tuned for a special bonus at the end too! Bangkok Chicken Wings with Coconut-Pineapple "Rice"
I got this recipe courtesy of Sun Basket in my Globetrotter Collection. In case you're not familiar with Sun Basket, they are an incredible company that delivers healthy, weekly meals and recipes that come from organic and sustainably sourced seasonal ingredients. Chef Justine Kelly and her team created this tasty (and Paleo-friendly) recipe as a nod to the legendary street food of Bangkok. I really love Sun Basket because they offer a wide variety of healthy options (Gluten-free, Paleo, and Vegetarian) with their menu selections and they are extremely affordable for the value you're getting (around $11 per meal). It's like someone does the grocery shopping and meal planning for you--AND also gets you the freshest ingredients--without you even having to leave your couch. WIN-WIN! So let's get started! Pat the chicken wings dry with a paper towel. Lightly oil a baking rack; line a sheet pan with foil. Set the rack on the prepared sheet pan. In a bowl or resealable bag, combine the chicken wings and baking powder. Season generously with salt; toss to coat. Roast the wings on the rack, turning halfway through, until well browned, 30 to 40 minutes. While the wings roast, prepare the rest of the meal. In a frying pan over medium heat, toast the coconut until golden, 2 to 3 minutes. Core the pineapple; cut into 1-inch pieces. In the same pan over medium-high heat, cook the pineapple in 1 to 2 tablespoons oil over stirring occasionally, until caramelized, 5 to 7 minutes. Transfer to a plate; don’t wipe out the pan. While the pineapple cooks, prepare the dipping sauce. Finely chop enough garlic to measure 1½ teaspoons. If using, stem and thinly slice the chile. In a large bowl, combine the dipping sauce base, garlic, lime zest, 2 tablespoons lime juice, and as much Thai chile as you like. Using a sharp knife or food processor, cut the cauliflower into rice-sized pieces. In the same pan, add 1 to 2 teaspoons oil if needed; warm over medium-high heat until hot but not smoking. Add the cauliflower, season with salt and pepper, and cook, stirring occasionally, until lightly browned, 3 to 4 minutes. Add the coconut milk and simmer until the cauliflower is tender, 1 to 2 minutes. Stir in the pineapple and cook until heated through, about 1 minute. Add the chicken wings to the sauce and toss to coat. 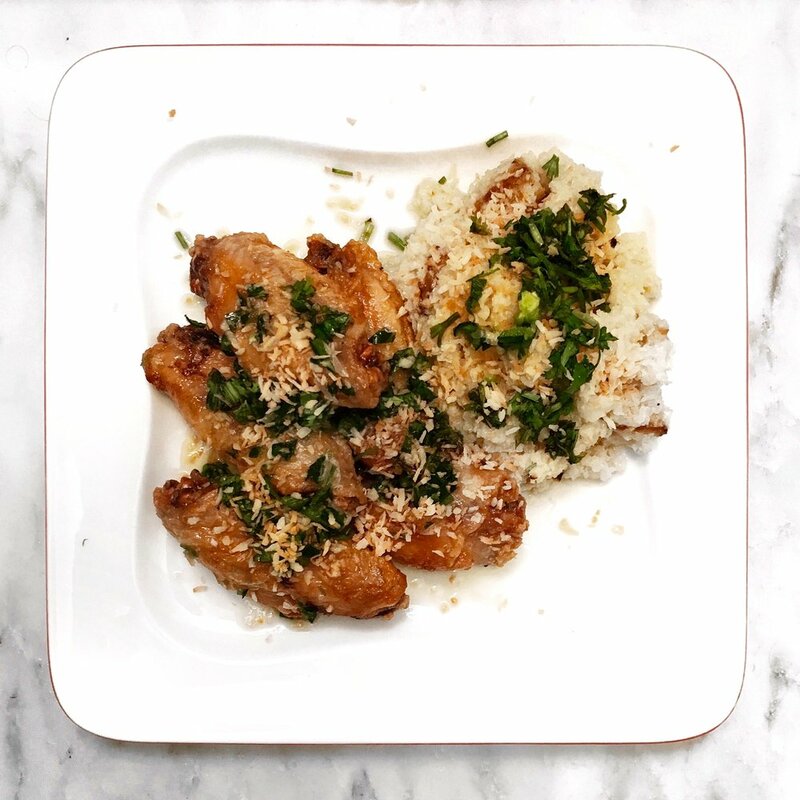 Transfer the cauliflower rice to individual plates; garnish with the toasted coconut. Top with the chicken, garnish with the cilantro, and serve with the sauce on the side. A classic Southeast Asian trick, a fine coating of baking powder makes the chicken wings more alkaline and helps them brown. If you don’t have a rack large enough to hold the wings in a single layer, cook them on a lightly oiled, foil-lined sheet pan. This dish came packed with flavors! You had tangy, sweet, and a little spice coming at you in every bite. We even added a little side of Sriracha (my condiment obsession) to give it an extra kick of spice. I've never made chicken wings at home before, so I was surprised how easy it was. The coconut-pineapple "rice" was another unique and healthy twist to this dish that gave a great alternative to eating rice on the side. Would absolutely recommend this recipe to anyone who loves those Asian flavors in their cuisine. We were both practically licking the plate afterwards because it was so yummy! BONUS: And if you'd like to try Sun Basket, I have a special offer for TCS readers! Click here to 3 FREE MEALS from Sun Basket right now! I'm no professional food stylist, but these were DELICIOUS! Special thanks to Sun Basket for providing this recipe and meal kit. All opinions are my own.